The major factor for me is the color mix and I let everything else to flow. This combination just can't go wrong! LOVE that coat! you look stunning! 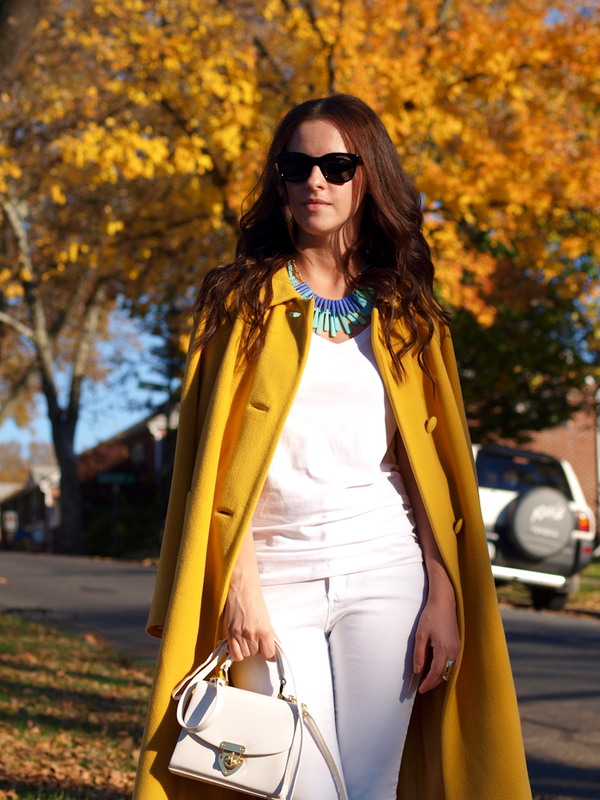 White & Yellow is a great combo! Love the necklace with it too. These colors are perfect with the autumn scenery! LOVE that coat! The whole look is lovely and super stylish in it’s simplicity! gorgeous cape, i need to get one! 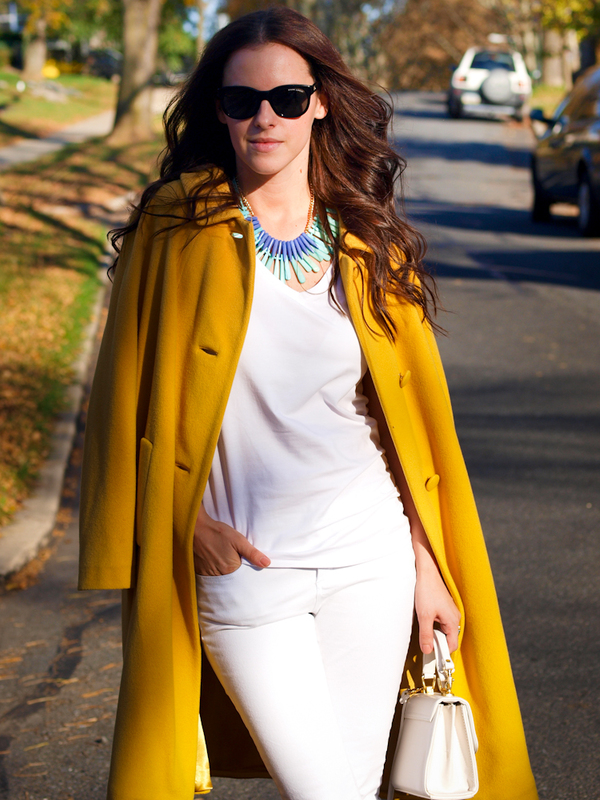 Love the yellow coat and the leopard print on the shoes! What a beautiful coat and such a great color for you – stunning outfit! Lovely! I love the coat It’s like the 1 J.lo to IDOL love it ! The coat and the shoes are such amazing pieces. You are one lucky girl for owing them. Your outfit is really perfect! the contrast of mustard, turquoise and animal print, I love the shirt and the pants were white, because so wonderfully highlighted accessories! with a perfect scenary with the autumn leaves ! You already give us so much inspiration with your outfits, and this one is not an exception! Once more it is PERFECTLY coordinate the colours and textures!!! Love the vintage coat(cannot believe it , looks so modern & brand new!!! ), the white outfit and the amazing leopard heels! 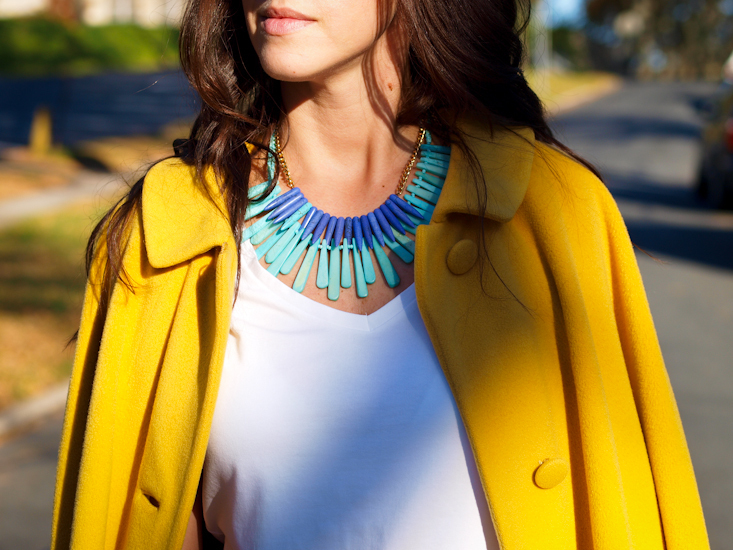 the blue necklace is giving this extra thing that only you can do it in such an harmonic way. From 1 to 10?? 11 of course!!!!! Your coat is a real eyecatcher, love it! the whole outfit is so pretty. Loving everything as usual! That pop of yellow with the leopard is somehow retro and super modern as well, especially with the turquoise! That coat is beautiful! I have a similar coat in yellow that I can’t wait to wear. Sadly, it’s still close to 90 degrees in L.A.! Have a great weekend, Victoria!